When analysing pesticides in complex food matrices it is important to be certain that the results are correct. If the results are questionable, then the analysis has to be repeated, which takes extra time and delays sample turnaround. Reporting a false positive could cause a shipment of food to be delayed or destroyed, impacting revenue for food companies. Reporting a false negative could result in contaminated foods reaching consumers, which could be catastrophic for the reputation of the food manufacturer and the testing laboratory. In order to meet the requirements for identification of pesticide residues, at least two MRM transitions are monitored and their ion ratios and retention times must match that of the reference for the compound of interest. 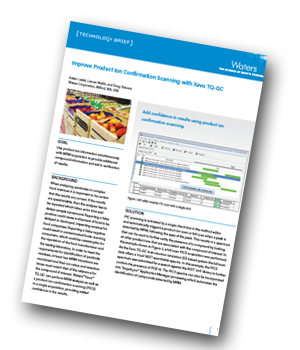 In this technology brief, learn how the Xevo TQ-GC can perform MRM analysis, as well as a product ion confirmation scanning (PICS) in a single acquisition, providing added confidence in your results.